Beakers are small creatures from Wario's Woods. 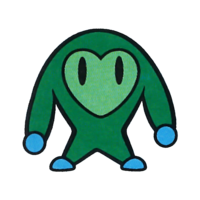 They are the rarest enemies, along with Scrams; they also happen to be identical to Scrams in that they can only be destroyed by diagonal bomb chains. A Beaker appears to have two faces on both sides of his body, one of which is two large, blank eyes, the other being a saddened face; Beakers constantly rotate to show off these faces. This page was last edited on April 24, 2019, at 04:24.